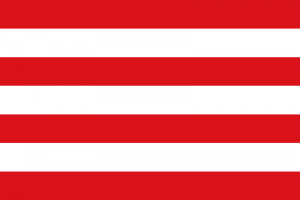 The flag of the Karno-Ruthenian Empire consist of seven horizontal stripes in red and white, interspersed and should be the first and last stripe red. To use of State, the National Flag will have the Ruthenian Eagle at its center. The tricolor of orange, black and white flag created in 2014 for the Kingdom of Ruthenia still a important symbol and is used sometimes. During the transition from Kingdom to Empire, the search for a particular identity for Karnia-Ruthenia and especially to their national symbols, was observed and widely studied. The idea would be to invoke the characteristics and the celebrated culture of the micronation while pay homage to the founder of micronation, the Emperor-King Oscar. Observance of the white and red were present in almost all the flags of the states of the Empire start a search for styles involving these colors. 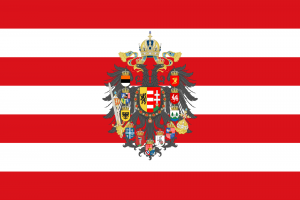 With genealogical studies pointing to a connection between the Imperial and Royal House with the Árpád Dynasty, the choice of the flag was facilitated and is very similar to “Árpád stripes”, except for having a strip less. However, the flag has a very different meaning of the Hungarian flag. As pointed out by the government on 26 May 2016, each stripe of the flag represent one of the states of the Empire at the time of its foundation, in the following order: Karnia, Ruthenia, Libertia, Horvatia, Gaussland, Acrin and Letzembourg. For use of state, the flag is added by the Imperial Eagle in its center. The National Coat of Arms have three versions, all with equal and concurrent use, with the opportunity to indicate the most appropriate time for the use. The main coat of arms of the Empire will be based on the work of Hugo Gerhard Ströhl: the “Ruthenian Eagle” or “Imperial Eagle”, a selfstanding double-headed eagle sable, armed and crowned or, holding a sceptre and sword in dexter claw and an orb in sinister claw, all proper, beneath the Ruthenian Imperial Crown proper stringed azure; on its breast an escutcheon surrounded by the Collar of the Order of the Edelweiss, bearing tierced per pale: Or, a lion rampant sable (House of Thomaz-Rocha), the Árpad stripes – four Argent and four Gules stripes (House of Árpad), Argent double cross on Gules base, situated inside a small Or crown, the crown is placed on the middle heap of three Vert hills (House of Goëtzën). On the wings and on the tail are arranged coat of arms of the lands, counterclockwise: Bessabia, Libertia, Escandia, Gaussland, St. Stephen, the coat of arms of the House of Goëtzën, Persenburg, St. Peter and St. Paul, Karnia, Acrin and Ruthenia. 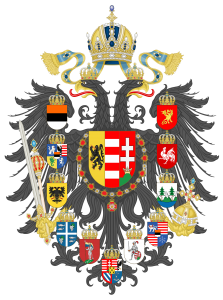 The medium coat of arms, also inspired by the work of Hugo Gerhard Ströhl, two angels in support, two escutcheons – in dexter the escutcheon of the lands of Karnia and in sinister the Imperial Eagle and the escutcheon of the Lands of Ruthenia – united by the dynastic escutcheon with a heraldic crown and surrounded with the collar of the Order of the Edelweiss and below the Order of the Queen, the Order of St. Stephen and the Order of the Lion and the motto “Indivisibiliter ac Inseparabiliter” and “XXXVI”. The small coat of arms is similar to the medium coat of arms, but dismissed the supports and the Order of the Queen, the Order of St. Stephen and the Order of the Lion, while maintaining the motto. 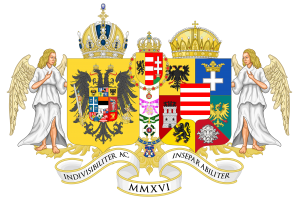 The Imperial Anthem of Karnia-Ruthenia is the national anthem of Karnia-Ruthenia and is deeply inspired by Gott erhalte Franz den Kaiser (“God Save Emperor Francis”), the anthem to Francis II, Emperor of the Holy Roman Empire and later of Austria. The original lyrics were by Lorenz Leopold Haschka (1749–1827), but the version used in Karnia-Ruthenia is inspired in the lyrics made by the musicologist Charles Burney; the melody is the same composed by Joseph Haydn. Haydn’s tune has since been widely employed in other contexts: in works of classical music, in Christian hymns, in alma maters, and as the tune of the “Deutschlandlied”, the national anthem of Germany. The idea of using this tune and lyrics came in 2016, after the signing of the Karno-Ruthenian Compromise of 2016 and symbolized the moment when the authorities of the Empire wanted to assimilate with the Austro-Hungarian traditions exalted by the Empire. The anthem would be recorded for the first time a year later, on 15 July 2017 by the Ban of Horvatia in a private audience with the Emperor and Duke of Libertia, and later made available to the public.